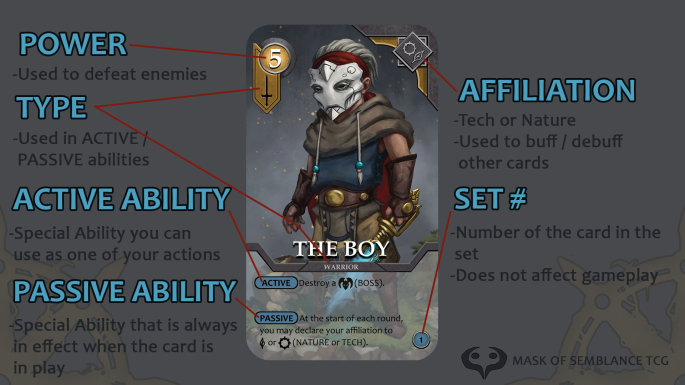 Welcome To The Mask Of Semblance Trading Card Game! The game is played with two players and takes around 15 minutes to complete. The game takes place from left to right with the players battling to destroy all of their opponents cards. Will you win by pure force or by guile? 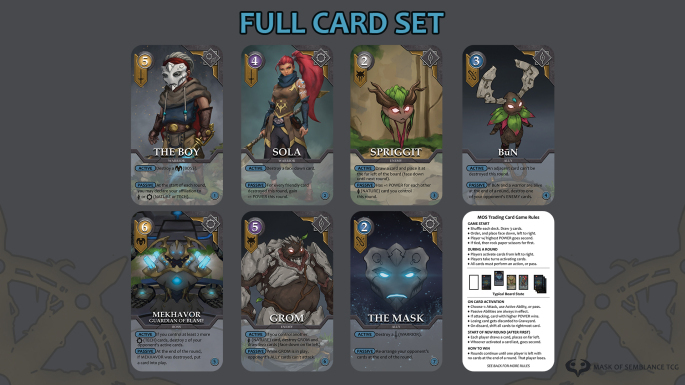 All of the cards have custom painted artwork based off of characters in the game, so you can fill your hand up with your favorite characters in the Mask of Semblance. Each card also comes with unique passive and active abilities that you can use to defeat your opponent. Each player shuffles their deck, then draws 3 cards each. Set an order for your cards, and place face down on your board, from left to right. (Strategy): Place your strongest card first, to have the upper hand on your first turn. Each player flips their cards. Player with the highest POWER card goes SECOND. If there is a tie, Rock, Paper, Scissors for first. Players activate cards from left to right. Players take turns activating their cards. All cards must preform an action, or pass. Choose 1: Attack with card’s POWER, use card’s ACTIVE ABILITY, or pass. PASSIVE ABILITIES are always in effect while a card is on the board. If attacking, the card with the higher POWER wins. If attacking and cards have the same power, you may trade and destroy both cards. The losing card gets discarded to the Graveyard. On discard, shift all cards to the rightmost card. Once a card has made an action, push it up slightly to show it has already went this round. Each player draws a card, and places it on the far left of their board. Whoever activated a card last, goes second at the start of this new round. Rounds continue until one player is left with no cards at the end of a round. That player loses. You may have no more than 5 cards on your board at any time. Any new card that comes into play during a round gets placed face down, on the far left of the board, until the start of the next round. You cannot lose while you have face down cards. If you run out of cards to draw, shuffle your discard pile and play those. Head Over to Our Contact Page!